At CES 2018 Intel released two new Hades Canyon NUC devices. The Intel NUC NUC8i7HVK and NUC8i7HNK both feature something special: Intel CPUs with integrated AMD Radeon Vega Graphics. What that means is that this generation of “high-end” NUC is going to have a much-updated GPU capability over previous generations using Iris Pro series GPUs. The NUCs have two of the five Intel + AMD Radeon Vega SKUs available in the different models. These NUCs have a major advantage over previous generation “Skull Canyon” NUCs, the AMD GPUs are based on the Vega line. With the previous generation, Intel Iris Pro iterations, the drivers for gaming and GPU compute were often not as well supported/ optimized than NVIDIA or AMD offerings. 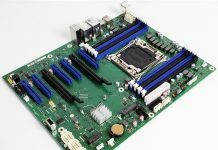 By introducing Intel x86 and AMD GPUs on the same package, customers can use better-supported driver bases. Aside from the improved driver support, the new chips are going to have a full 4GB of HBM2 memory onboard, instead of 128MB of eDRAM memory for the outgoing Iris Pro 580. That is a considerable upgrade that will help performance with the new Intel + AMD packages. With this latest generation, Intel has retained a similar form factor and feature list compared to the Skull Canyon generation NUCs. 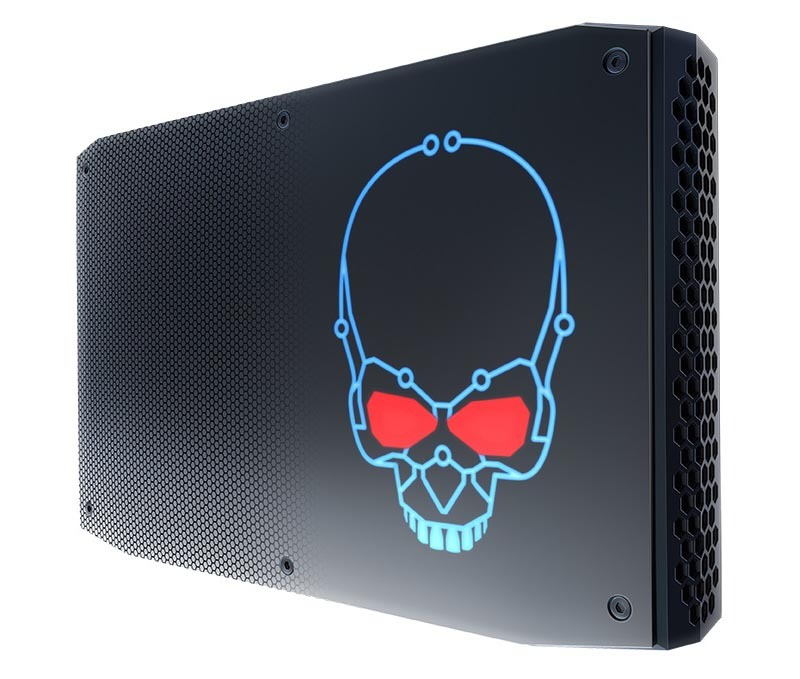 The Skull Canyon NUCs essentially set the bar for compact, high-performance, and expandable compute platforms. 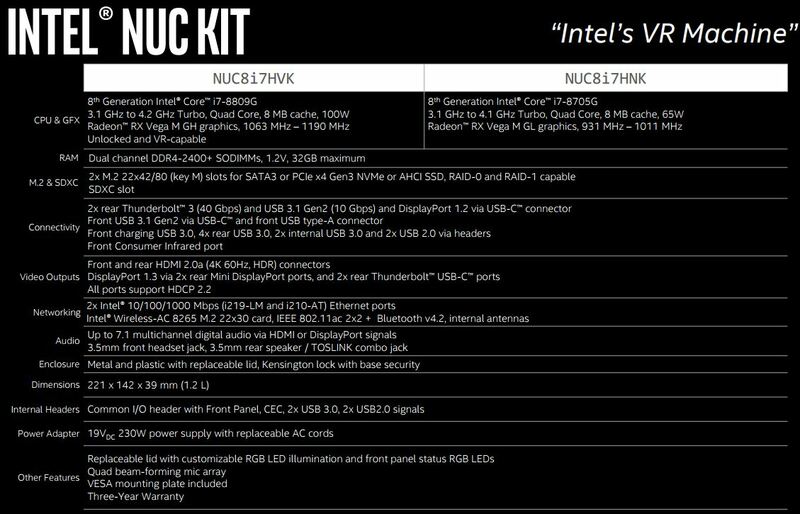 Here is the spec sheet (subject to finalization and FCC approval) for the Intel NUC NUC8i7HVK and NUC8i7HNK devices. There are a few key items here for STH readers. 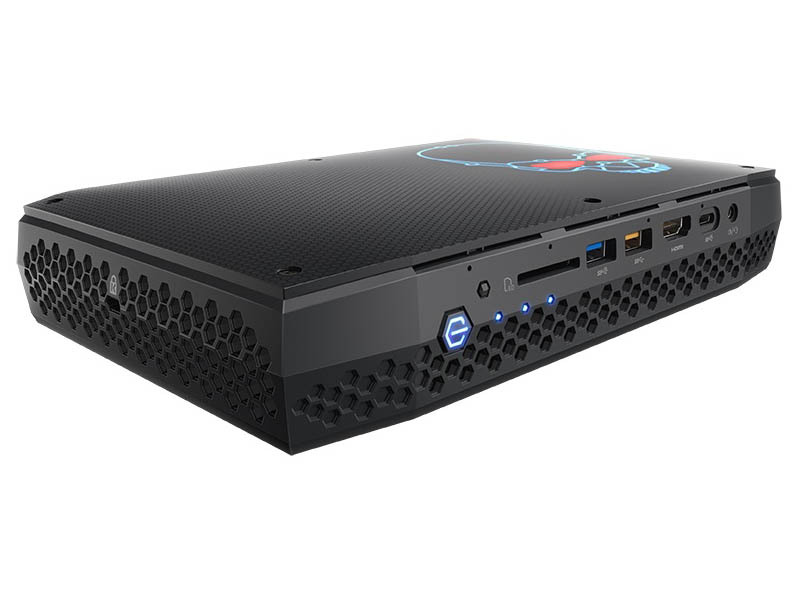 First, the NUC8i7HVK has Intel Core i7-8809G has both an unlocked multiplier and higher-end AMD Radeon Vega GPU onboard. The NUC8i7HNK has a Core i7-8705G with a lower 65W TDP and without unlocking. Aside from those differences, the NUCs are relatively similar. There is support for dual-channel DDR4 SODIMMs (up to 32GB) along with two M.2 drives. That dual M.2 feature is important because it allows either RAID 0 or RAID 1 drive operation. It also is one of the key features that has allowed the previous generation NUC devices to be popular on-the-road demo cluster devices. The front of the unit has relatively mundane SD cards, two USB ports, HDMI and even an IR port. The rear I/O in comparison has much more. There are dual display ports, and a HDMI port along with four USB 3.0 ports. For networking, there are two Intel-based gigabit Ethernet ports along with 802.11ac 2×2 Wi-Fi. This plethora of networking is another reason these devices have been extremely popular. The rear has two Thunderbolt 3.0 ports via a USB type-C connector. That means that there are dual 40Gbps connections to external devices or monitors available as well. For those looking to have external storage or networking, adding Thunderbolt 3.0 enclosures can be costly, but it is a good solution for portable demo clusters. At STH, we are sure these are going to be popular. They may not fulfill all of the needs for primary workstations for our users. At the same time, for compact labs and portable cluster demos they will be popular. There are a few areas for consideration with the new NUCs. We wish Intel stepped up and offered a 10GbE option. Dual 1GbE is good but it is fairly low-end networking in 2018. Even 10GbE is moving towards being low speed commoditized networking as 25GbE and faster have dropped sharply in price. With dual Thunderbolt 3.0 one could add a 10/25/40GbE NIC but the cost of using Thunderbolt is significantly higher. The new NUCs are also much larger. Part of this is the higher power consumption. The new units will ship with a 230W power supply while the previous-generation units had a 120W power supply. Although we do not have internal pictures yet, the volume of the units is going to be over 70% larger than the previous generation. From the power specs, we might expect a much larger cooling subsystem. That additional power and space make this generation of NUC both more performant at the expense of being less portable. The problem with 10GBe is the cabling. It is still very rare to see fiber optic cables in offices, SFP+ is something for server rooms only at the moment. 10GBE is now considered “low end”? Have I pulled a Rip Van Winkle? Does that mean I can get a Cisco 48 port 10GBE switch for under $10K now? @Ed While I agree, there is a large difference speed-wise between 10G and 25/40/100G that this site tests. @Marcelo B . The problem is data, not cabling. No data for 10Gbit in SOHO. A single/dual 10G copper PHY isn’t all that pricey these days, so I agree with Cliff that on the desktop side it should be there, especially on a supposedly high-end box, regardless of physical size. On the switch side, yeah, 20, 30, and 40+ port counts with a sufficient switching fabric are still relatively expensive compared to old Gig E.